With a sophisticated X-ray analysis scientists have identified why parts of the Van Gogh painting "Flowers in a blue vase" have changed colour over time: a supposedly protective varnish applied after the master's death has made some bright yellow flowers turn to an orange-grey colour. The origin of this alteration is a hitherto unknown degradation process at the interface between paint and varnish, which studies at the European Synchrotron Radiation Facility ESRF in Grenoble (France) and at Deutsches Elektronen-Synchrotron DESY in Hamburg (Germany) have revealed for the first time. The results are published in an upcoming issue of Analytical Chemistry, the first author of which is Geert Van der Snickt, who received a PhD in Conservation and Restauration from the University of Antwerp (Belgium) for this work. The research team was led by Koen Janssens from Antwerp and also comprised scientists from TU Delft (Netherlands), the French CNRS, the Kröller-Müller Museum in Otterlo (Netherlands), the ESRF and DESY. 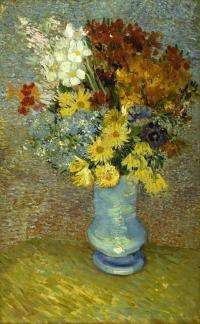 Vincent Van Gogh (1853-1890) painted "Flowers in a blue vase" in 1887 in Paris, and in the early 20th century, the painting was acquired by the Kröller-Müller Museum. The master usually did not varnish his works, but this painting was later covered with a supposedly protective varnish, like many other Van Gogh paintings in the first half of the 20th century. "A conservation treatment in 2009 revealed an unusual grey opaque crust on parts of the painting with cadmium yellow paint," says paintings conservator Margje Leeuwestein from the Kröller-Müller Museum. The cadmium yellow (cadmium sulphide, CdS) used by Van Gogh was a relatively new pigment, of which it has recently been discovered that in unvarnished paintings, it oxidizes with air (to cadmium sulphate; CdSO4) making the pigments lose colour and luminosity. "We identified this process a few years ago, and the observation that instead of a slightly off-white, transparent oxidation layer, the pigments in this painting were covered with a dark, cracked crust intrigued us very much," says Janssens. "The removal of the orange-grey crust and discoloured varnish was not possible without affecting the very fragile original cadmium yellow paint on these parts," adds Leeuwestein. To identify what had happened, the museum took two microscopic paint samples – each only a fraction of a millimetre in size - from the original painting and sent them to Janssens for a detailed investigation. The scientists studied the samples using powerful X-ray beams at the ESRF and at DESY's PETRA III, revealing their chemical composition and internal structure at the interface between varnish and paint. To their surprise, they did not find the crystalline cadmium sulphate compounds that should have formed in the oxidation process. "It emerged that the sulphate anions had found a suitable reaction partner in lead ions from the varnish and had formed anglesite," explains DESY scientist Gerald Falkenberg. Anglesite (PbSO4) is an opaque compound that was found nearly everywhere throughout the varnish. "The source of the lead probably is a lead-based siccative that had been added to the varnish," adds Falkenberg. "At the interface between paint and varnish, the cadmium ions together with degradation products from the varnish itself also formed a layer of cadmium oxalate," says ESRF scientist Marine Cotte. Together with the anglesite, the cadmium oxalate (CdC2O4) accounts for the opaque, orange-grey crust disfiguring parts of the painting on a macroscopic level. "The research into this hitherto unknown degradation process of varnished cadmium yellow oil paint allows to better understand the current appearance of the painting," explains Leeuwestein. Joris Dik from TU Delft adds that "it also provides information on how later-applied varnish layers may contribute to the decline of certain pigments of a painting. 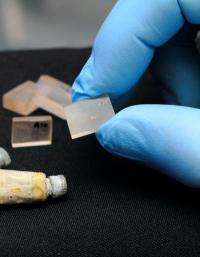 In the future, this degradation process can hopefully be inhibited or even prevented thanks to novel preservation and conservation techniques." Whether removing the varnish and crusts from paintings with this type of degradation is possible and appropriate is not yet fully understood. Leeuwestein adds that "in every similar case of a possible varnish and crust removal, it should always be considered that this varnish and crust contain original material from the cadmium yellow oil paint. The possible removal of original material from a painting during a conservation treatment is of course undesirable." After this discovery, conservators in many museums will have to newly address the question of restoring Van Gogh paintings. "This study on the deterioration of cadmium yellow is an excellent example of how collaboration between scientists and conservators can help to improve our understanding of the condition of Van Gogh's paintings and lead to better preservation of his works," says Ella Hendriks, Head of Conservation of the Van Gogh Museum in Amsterdam, who did not take part in the study. "Many of Van Gogh's French period paintings have been inappropriately varnished in the past and removal of these non-original varnish layers is one of the challenges facing conservators on a world-wide basis today. The type of information provided by Janssens and his team is vital to support the difficult decisions that conservators often have to make regarding such complex cleaning treatments." "Once again, we find that paintings by Vincent van Gogh are not static entities for decades and centuries to come. Over a period of 100 years, they can actually be considered a fairly reactive cocktail of chemicals that behaves in unexpected manners", concludes Janssens. Geert van der Snickt adds that "especially the presence of sulphides puts the durability of the paintings at risk." In the next four years, Janssens' research group plans to study how museum indoor conditions and air pollution affect cadmium yellow and related sulphide-containing pigments used by artists.